Can someone give me an idea whether I'm on the right path with my circuit. It's an LED tactile switch from Jaycar. 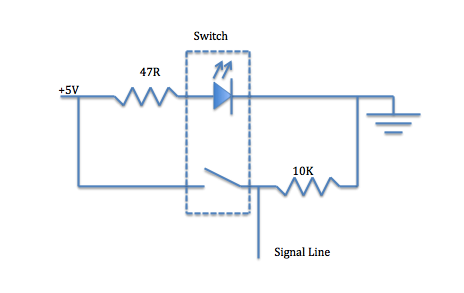 My signal line is connected to a digital pin on an EtherTen and I have programmed as an INPUT. When pressed, the signal line goes to 5V. Just after some feedback if possible. I'm having a couple of issues and wanted to eliminate the switch circuit if I can . Can no one provide any thoughts or input? Could you be more specific about what sort of issues you were having? To eliminate the switch being the problem, why not just use a breadboard wire as the switch? I do most of my fiddling on breadboards, with short pieces of wires. I only put a physical switch in place after my initial testing, and just prior to installing perminently.